A new book tells the intriguing story of the Seattle 7 and their search for justice. I FIRST READ Kit Bakke’s “Protest on Trial” as a work in progress. The book’s publisher shared a copy of the manuscript with me for comment, and as I read through it, I increasingly responded with recommendations. 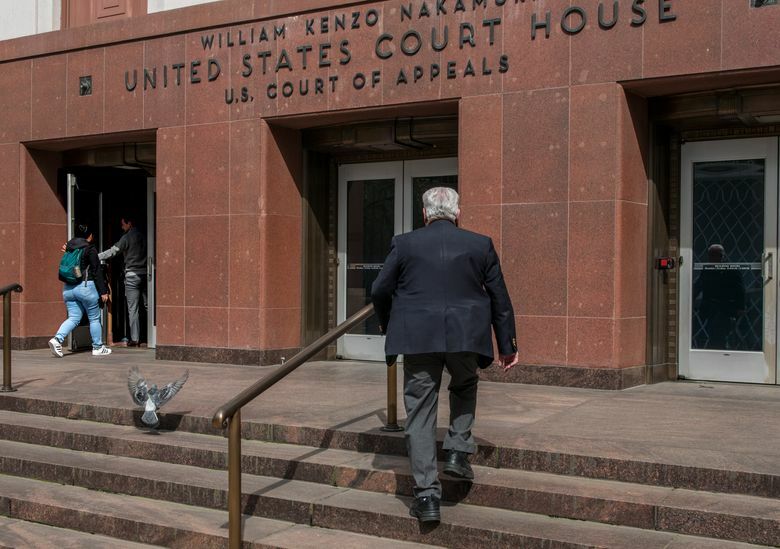 This week’s magazine’s cover-story excerpt of the book’s brilliant late chapter on courtroom mayhem should, I hope, inspire many Pacific NW readers to read it all. In 1970, Doyal Gudgel Sr. snapped this week’s two “Then” photographs at the front door of the federal courthouse, directly across Fifth Avenue from the Seattle Public Library. 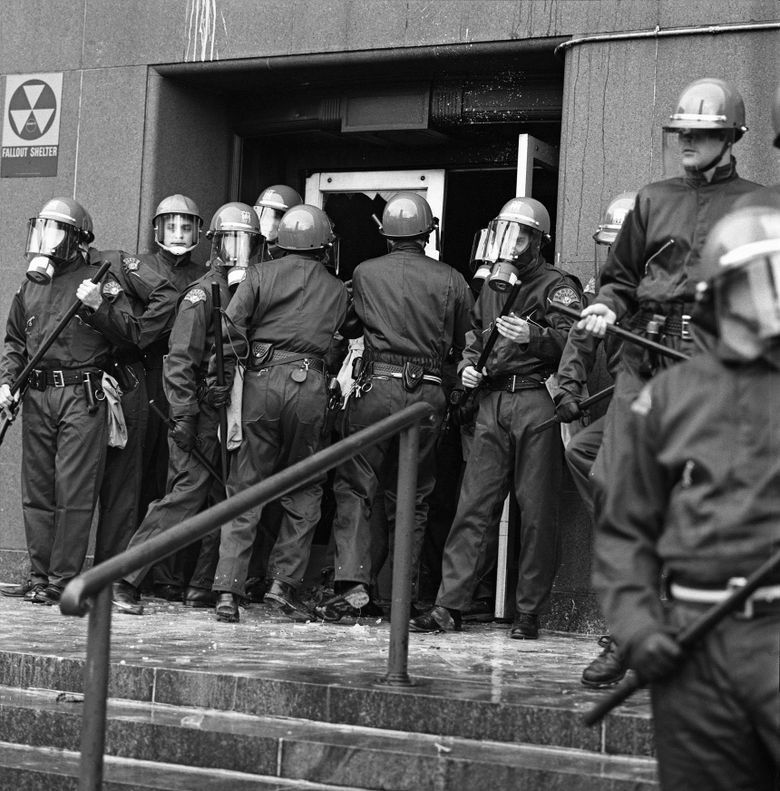 The oldest one, with the phalanx of helmeted Seattle police guarding the courthouse’s broken front door, was photographed Feb. 17, 1970. That was TDA, or “The Day After,” a one-day protest. (I’m confident readers will be enlivened to learn more about TDA and the political shenanigans surrounding it by reading the book.) Besides smashing the front door, angry TDA protesters also threw paint, and some of it can be seen in long drippings above the front door. 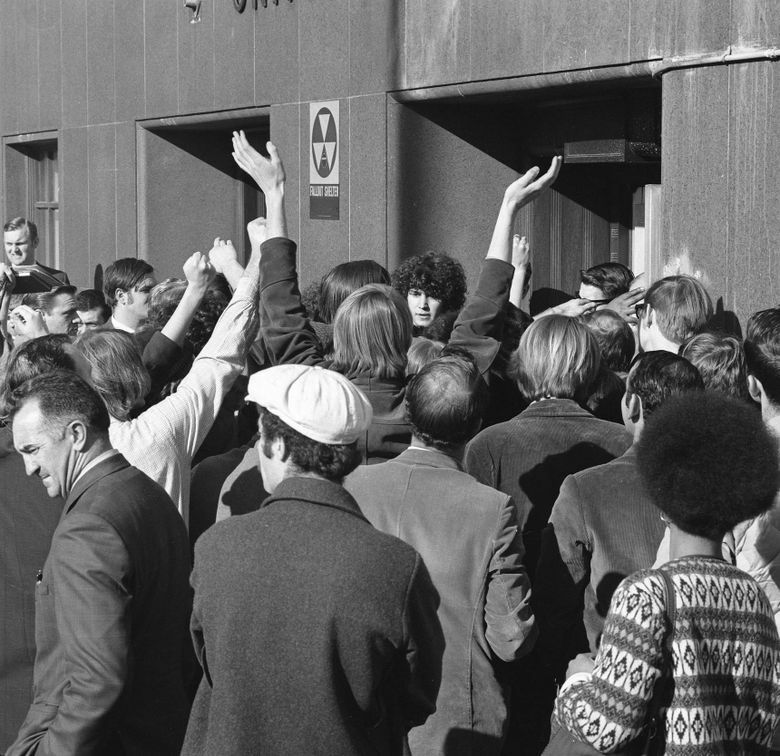 It seems that in the second Gudgel “Then” snapshot, the running paint survives as a smear above the same door on April 17, 1970, when it was time for another organized protest. (Read the book, OK?) As a “stringer” providing still shots like these and 16mm film for media clients and law-enforcement investigations, Gudgel responded to opportunities he first discovered on the police-radio reports he listened to while tending his store, Burien Radio and Television. To these eyes, Gudgel’s April photo resembles a designed tableau. The man on the far left seems to be drawn, at least in profile, from central casting for tough investigators. The sunlit April photograph aims at one of the Seattle 7: Jeffrey Alan Dowd, who at 20 years old carried a mop of curly hair above a still-cherubic face. Now, decades later, Dowd lives in Southern California and is better known as “The Dude,” an eccentric pop creation from Hollywood. Here the pre-Dude Dowd is cradled by admirers of his political courage, some showing fists, and one of them reaching slim arms, it seems, in reverence.